In today’s increasingly high-tech and efficiency driven business landscape, internal processes such as accounts payable (AP) are being looked to as prime candidates for modernization. 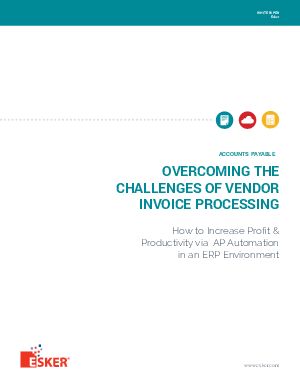 Traditional, paper-based methods of vendor invoice processing are associated with higher costs, lower visibility and longer processing times — all barriers that ultimately impede business progress and the ability to gain a competitive advantage. The purpose of this white paper is to explore the specific challenges faced by companies using manual processing methods while shedding light on the key features and proven benefits of automation. Is it time to modernize your AP process? Read this white paper to get started!